Special Containment Procedures: SCP-784 has been disguised as a gated community and is currently surrounded by a 3.5-meter-high, 0.8-meter-thick concrete wall to deter intrusion. The top of the wall is lined with electrified steel cable, and the gate is to be locked. Any non-Foundation personnel attempting to enter SCP-784 are not to be interfered with, due to the possibility of provoking a violent reaction from the occupants of SCP-784. Non-Foundation personnel exiting SCP-784 are to be detained, questioned, and released following administration of a Class-B amnestic. Foundation personnel entering SCP-784 are to be dressed in traditional Christmas wear prior to entering SCP-784. The area composing SCP-784 is to be monitored remotely by a Foundation-controlled weather balloon. In the event that personnel are required to enter SCP-784, all involved personnel must have memorized the entire contents of the A██ P███████ 'Beginners Guide to Christmas Carols'. They are to be checked for precision prior to entering SCP-784. Due to SCP-784's proximity to suburban housing developments, as well as the ramifications of provoking SCP-784-1, patrols within SCP-784 are to be unarmed except during a Noel event. In the case of an unexpected Noel event, members of SCP-784-1 are to be restrained as non-violently as possible while Foundation personnel prepare procedure 784-C. Description: SCP-784 is a neighborhood in the town of ████, Texas. 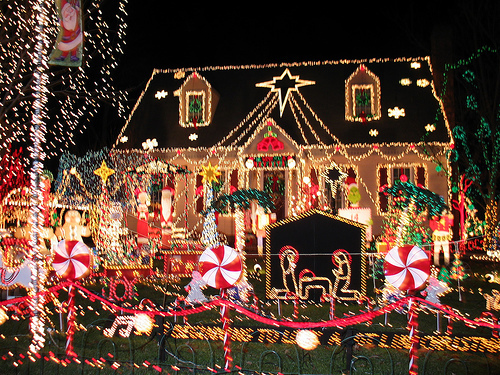 Currently SCP-784 is made up of twenty-four houses and two apartment buildings, all of which are decorated with ██████-brand Christmas lights at a density of approximately fifteen lights per square meter of housing. SCP-784 will always be covered by between 12 and 33 centimeters of snow, though no unseasonable weather will occur above SCP-784. All houses within SCP-784 are occupied by a variable number of instances of SCP-784-1. SCP-784-1 is composed mostly of adult humans, all of whom wear sweaters typically associated with holiday gift giving. The number of unique instances of SCP-784-1 within SCP-784 has been estimated at three hundred. Instances of SCP-784-1 have not been observed engaging in reproductive activity, and no instances of SCP-784-1 have ever observably been born within SCP-784. Instances of SCP-784-1 appear to age normally, though the death of an instance of SCP-784-1 has never been observed by Foundation personnel. All instances of SCP-784-1 express traits commonly associated with 'Christmas spirit' throughout the year. These traits include singing of Christmas carols, performance of plays commonly associated with the birth of Christ, and various eggnog-related festivities. These activities are engaged in daily, though specific activities will never repeat more than once per week. Foundation vehicle which was being transported to Area ██ for use as a gunnery hulk. Convoy stopped overnight near SCP-784. Egg several in-transit prefabricated buildings. 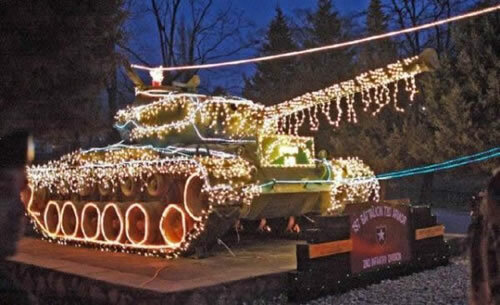 Convert a Humvee into a sleigh. Replace a shipment of fragmentation grenades with similar-appearing glass ornaments. Fill the gas tank of several vehicles with █████-brand eggnog. Weld steel antlers onto one hundred and fifty-six safety helmets. Fifteen collars, red with a small bell. One full-body reindeer holiday outfit. Human subjects who do not meet SCP-784's criteria for 'Christmas spirit' will be assaulted by SCP-784-1, incapacitated, and forcibly directed into the nearest household. They will not be seen until the following day, when they will exit the household dressed similarly to other instances of SCP-784-1. Attempts to retrieve affected personnel have been met with great resistance on both the part of SCP-784-1 and the affected individual. The criteria which SCP-784 follows for definition of 'Christmas spirit' appear to be extremely broad. See addendum 784-A for a complete log of personnel abducted, and assumed reasons for abduction. Approximately once per month, SCP-784-1 will attempt to exit SCP-784 and enter the surrounding suburban community; this is referred to by on-site personnel as a 'Noel event'. During a Noel event, each instance of SCP-784-1 will carry a string of Christmas lights estimated to be fifteen meters long. Instances of SCP-784-1 will attach these lights to any nearby house, which will become decoratively and functionally identical to all other houses within SCP-784. Signs of an incoming Noel event include increased festivity during the day preceding the event, excessive eggnog consumption by a significant portion of SCP-784-1, and an increase in the number of decorations present within SCP-784. Procedure 784-C is to be executed prior to the occurrence of a Noel event. Foundation personnel are to dress themselves in traditional 'Santa' outfits, and distribute themselves near the exit of SCP-784. They are to begin singing 'Good King Wenceslas' and distributing non-alcoholic eggnog to other personnel. On the arrival of SCP-784-1, personnel are to distribute eggnog mixed with a mild sedative to the crowd. Personnel are to appear friendly and cheerful at all times, as SCP-784-1 has proven capable of abducting personnel while nearly unconscious. Following the distribution of eggnog, personnel are encouraged to sing carols associated with peace and goodwill. 'Silent Night' has proven most effective. Instances of SCP-784-1 will begin to sing along, and personnel are to accept their choice of song. SCP-784-1 will begin to fall unconscious as the night progresses. Unconscious instances of SCP-784-1 will be removed to nearby houses by other instances, and personnel are not to interfere with this process. Any interference with the actions of SCP-784-1 may trigger a violent response, and will wake all instances of SCP-784-1. Instances of SCP-784-1 not affected by procedure 784-C are to be silently incapacitated when no longer visible from the gates of the community, and returned after all other instances of SCP-784-1 have re-entered SCP-784. In the event that procedure 784-C fails, Foundation personnel are to release an aerosolized sleeping gas. Foundation personnel are to restrain instances of SCP-784-1 until the gas takes effect, at which time all instances are to be returned to SCP-784. Standard cover story 139 ("Drunken Football") is to be used to respond to any concerns expressed by nearby residents. Agent Paulsen, on patrol within SCP-784, wished a nearby instance of SCP-784-1 "Happy holidays". Approximately eight instances of SCP-784-1 surrounded Paulsen, who was unable to escape. Paulsen was dragged into a nearby home. Agent Matthews sang the incorrect verse of 'Silent Night' while on night patrol within SCP-784. Multiple instances of SCP-784-1 incapacitated Matthews non-violently using a nearby string of decorative lights. Attempted intervention by Agent Sanderson led to the involvement of a large crowd of SCP-784-1, which overwhelmed both agents. Matthews and Sanderson were dragged into a nearby home, after which personnel reported hearing the sound of Christmas carols from within the home for several days. Agent Anderson collided with a lawn ornament, apparently a 'Santa' in the style of the traditional lawn gnome. Anderson proceeded to swear violently for the next fourteen seconds. Three nearby instances of SCP-784-1 held Anderson in place. A fourth emerged from a nearby home with a quart of eggnog, which Anderson was forced to ingest. Anderson collapsed and was dragged into the home from which the eggnog was retrieved. Agent Davids was presented with a gift by a child instance of SCP-784-1. Davids accepted the gift, but apparently failed to react with proper enthusiasm. Davids was incapacitated by a child instance of SCP-784-1 which tackled his legs. Several children emerged from a nearby home before Davids recovered, and then dragged Davids into the home which they had exited.